It is no secret that many US schools are struggling to provide the globally competitive and informed education that students need and deserve and that the nation requires. There are many political and vested-interest reasons for this failing, and bringing needed change—particularly in addressing the glaring need for teaching geography and GIS in the K–12 education system—has been a slow and frustrating process. While there has been an explosion of innovation, investment, implementation, and jobs in the geography and GIS fields in business, government, higher education, and society at large, the K–12 world has been slow to adapt. High school and middle school students in the United States are unprepared to exploit these national needs and take advantage of these employment trends. Fortunately, there is hope that this situation can be changed. First, we can work to add dedicated funding for K–12 geography and GIS education into the upcoming reauthorization of the federal Elementary and Secondary Education Act (ESEA), also known as the No Child Left Behind Act. Second, Esri's recent donation of ArcGIS Online software to all K–12 schools in the United States through president Barack Obama's ConnectED Initiative offers an extraordinary opportunity to jump-start geography and GIS education in our schools right now. 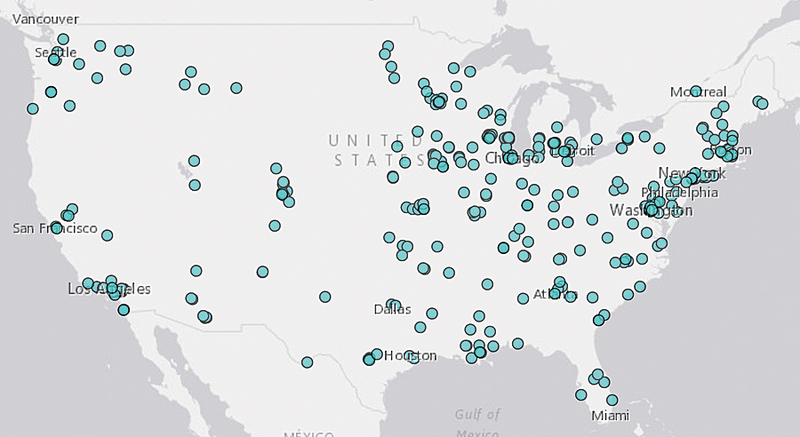 Many GIS professionals want to help educators and youth use GIS, as this map of the current GeoMentors network shows. These GeoMentors have provided links for learning about and connecting with them. Go to geomentors.net/participate to volunteer as a GeoMentor. To help achieve this end, the Association of American Geographers is working together with Esri to develop the national GeoMentors program to support schools and teachers as they bring GIS (and, by extension, geography) into their classes and curriculum. We invite and encourage everyone within the geography and GIS communities to consider helping out in schools across the United States by volunteering for the ConnectED GeoMentors program. We welcome the entire GIS community—from GIS professionals and geographic information scientists to educators and undergraduate students—to volunteer as GeoMentors. As a GeoMentor, you will play a pivotal role in improving GIS and geography education by sharing your skills and experiences. GeoMentors will have access to a wide array of online materials to help teachers and schools incorporate GIS projects and geographic learning into their classrooms. To become a GeoMentor, visit geomentors.net and click Participate. AAG and Esri are now building a diverse and talented network of GeoMentors with whom you can share your experiences, challenges, success stories, and best practices. We are seeking volunteers from all scientific disciplines engaged with GIS—from social and physical scientists to engineers building transportation systems and historians doing GIS-based research projects. Professionals across the public, private, academic, and nonprofit sectors are part of this exciting opportunity to build student understanding of and enthusiasm for the ubiquitous applications of GIS in their communities and around the world. Whether your expertise is on the fundamental geographic concepts of space, place, time, and dynamic maps or you are an expert GIS user with advanced spatial analysis skills, you can play an important role as a GeoMentor in the ConnectED Initiative. 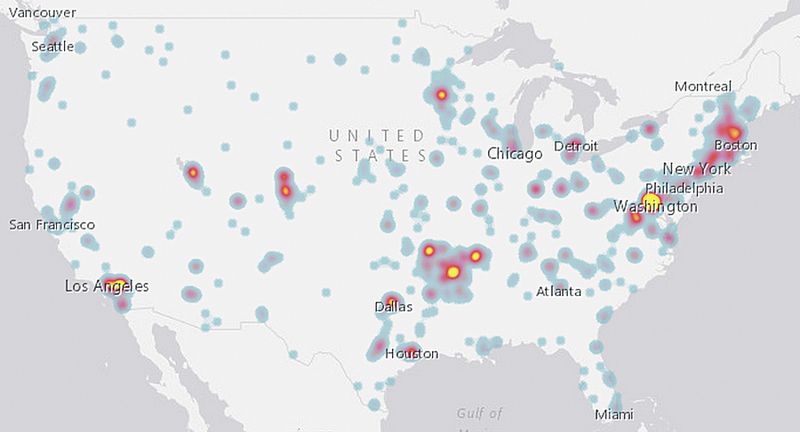 This heat map shows the increase in the number of schools getting GIS through the ConnectED Initiative. Blue represents areas with the fewest number of schools using GIS through ConnectED; red indicates areas with increased usage; and yellow shows areas with the greatest number of schools using GIS. 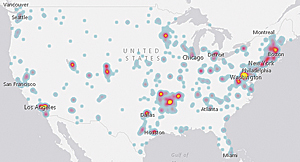 For resources and an ArcGIS Online request form for your school, visit connected.esri.com. Getting started in the GeoMentors program is easy. The first step is to reach out to your personal and professional networks to find opportunities to improve geography and GIS education in your community. You can begin by contacting local schools, school districts, or teachers you know in your area to see if they are taking advantage of ConnectED's GIS donation program. You could check with the schools your children, relatives, or neighbors go to, or even your own alma mater. If your local school administrators do not know about the program, you can help bring free GIS technology and geographic learning to them and their school districts. If your local schools are already participating in the ConnectED Initiative, you can help educators acquire and improve their GIS skills or help develop geographic activities and GIS projects to use in classrooms. You can begin preparing now by going to geomentors.net/prepare to learn more about ArcGIS Online resources for educators and find sample activities for students to do in their classes. Contributing to your community and improving geography and GIS education in the United States is rewarding in its own right. Working with and learning from other GeoMentors in the program is a great way to create professional networks of knowledgeable, caring, and civic-minded colleagues like yourself. Most important, by coming together with the GeoMentors network and Esri, we can all make a real difference in the quality of education in our schools and in the lives of students throughout the nation. Thanks in advance for your support and participation in this crucial GeoMentors program. Read other articles in the "Crossing Borders" series.